When cleaning your Granite countertops you will need these supplies: a soft cloth or sponge, bucket or large bowl, neutral dishwashing liquid, warm water, and a microfiber cloth. Add a few squirts of dishwashing soap to a bucket of warm water. Use your cloth or sponge to wipe your granite thoroughly. Rinse completely to keep surface from fogging up. Use hot water to rinse because it works better. Wipe the surface dry with the microfiber cloth to a shine. 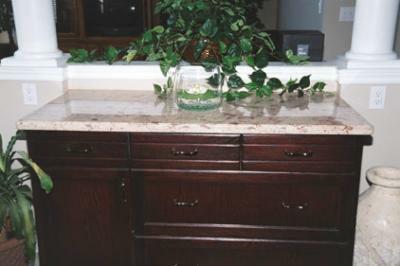 Periodically clean your granite surfaces with a natural stone or granite cleaner to restore the shine.